In 1863 Pauline Weaver and Abraham Peeples came from California to find gold. They found gold and the rush was on. In 1887 The Congress mine was formed and the town had a name. On March 14, 1895 the railroad came. Congress was booming. In 1910, after producing over 7 ½ million dollars, the gold ran out.The second boom started with U.S. highway 89 in 1926.The post office moved to Congress Junction in 1938, where it remains. The community now known as Congress is the old Congress Junction. Little remains at the original townsite. 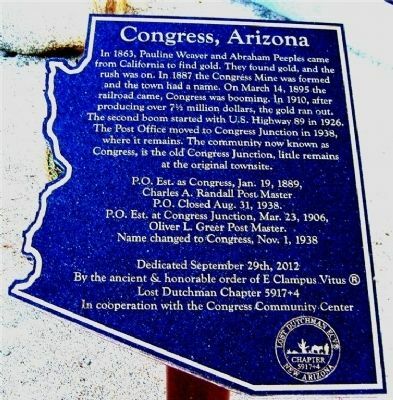 Erected 2012 by Lost Dutchman chapter 5917+4, E Clampus Vitus in Cooperation with the Congress Community Center. W. Marker is in Congress, Arizona, in Yavapai County. Marker is on Santa Fe Road, on the right when traveling south. Touch for map. The marker is located on the grounds of the Congress Public Library. 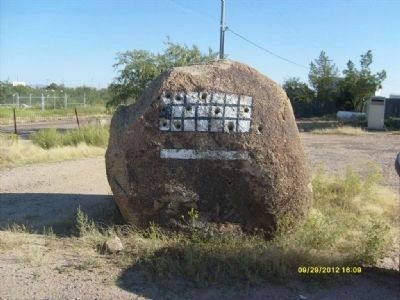 Marker is at or near this postal address: 26750 South Santa Fe Road, Congress AZ 85332, United States of America. Touch for directions. Other nearby markers. At least 8 other markers are within 15 miles of this marker, measured as the crow flies. In Memory of Charles Churchill Small (approx. 5½ miles away); Peeples Valley Pioneer Cemetery (approx. 10.9 miles away); Wickenburg Massacre (approx. 14 miles away); Vulture Mine (approx. 14.4 miles away); Garcia School (approx. 14.7 miles away); Henry Wickenburg (approx. 14.8 miles away); Everett Bowman (approx. 14.8 miles away); The Old Brick Post Office (approx. 14.8 miles away). 3. One of Several Drilling Rocks at the Marker Site. More. Search the internet for Congress, Arizona. Credits. This page was last revised on June 16, 2016. This page originally submitted on October 2, 2012, by Frank Houdek of Kingman, Arizona. This page has been viewed 623 times since then and 18 times this year. 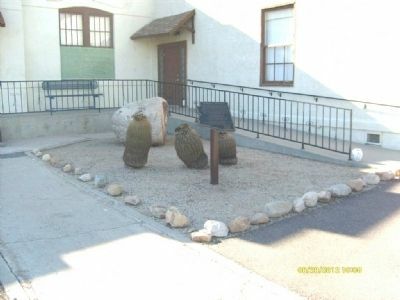 Photos: 1, 2, 3. submitted on October 2, 2012, by Frank Houdek of Kingman, Arizona. • Syd Whittle was the editor who published this page.